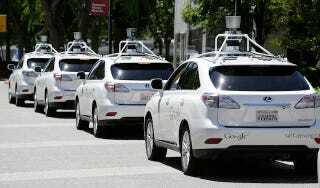 Google hopes to smash the prevailing owner-operator model for the automobile. In the future, you’ll simply reach for your smart phone or other connected device and call for a self-driving car whenever you need it. Rather than spending 90 percent or more of their time parked, cars will see much higher utilization rates. That change alone would unleash a real-estate revolution in cities. Vast stretches of space now earmarked for parking would become available for other uses. To be sure, self-driving cars would still need to be stored somewhere when not in use, but there would be no need for random egress; the cars could be packed end-to-end. If you call for a car, and there isn’t already one on the road close to your location, you’ll simply get the next vehicle in line. There are, of course, some reasons to be skeptical that urban cars will ultimately evolve into public resources. For one thing, it would be directly at odds with the goals of the automotive industry, which would like each household to own at least one car. For another, in order for this model to work, commuters would have to share the cars at peak times; otherwise they might be so scarce and expensive during busy periods that many people couldn’t afford a ride. A related problem is safety in a shared car. Even if the vehicle’s software is able to solve the logistics issues and provide efficient and timely service, a small car is, after all, a much more intimate space to share with complete strangers than a bus or train. It’s easy to imagine solutions to this problem, however. For example, cars designed to be shared by solo travelers could simply be divided into compartments. You wouldn’t even need to see or be aware of others sharing your car. To avoid a feeling of being closed in, virtual windows could be mounted on the dividing walls; high resolution screens would display images captured by cameras mounted on the exterior of the car. By the time self-driving cars are in routine operation, the hardware to accomplish all this will be remarkably inexpensive. The vehicle would stop, a green light would flash on one of the doors, and you would get in and ride to your destination just as if you were traveling alone. You’d be sharing the vehicle, but riding in your own virtual commuter pod. Other vehicles might be designed to carry groups (or more sociable solo travelers), or perhaps the barriers could slide away upon mutual consent. Then, again, the commuter pod might not need to be “virtual.” In May 2014, Google announced that the next phase of its research into self-driving cars would focus on the development of two passenger electric vehicles with a top speed of 25 miles per hour and specifically geared toward urban environments. Passengers would call for the car and set its destination with a smart phone app. Google engineers have come to the conclusion that returning the vehicle to the driver’s control in the event of an emergency is unfeasible, and the vehicles will be fully automated—with no steering wheel or brake pedal. The market might also create other solutions geared toward sharing automated vehicles. Kevin Drum of Mother Jones, who thinks that “genuine self-driving cars will be available within a decade and that they’ll be big game changers,” has suggested that it might be possible to purchase a share in a car service, with guaranteed availability, for a fraction of what it would cost to buy a vehicle. In other words, you would share the car only with fellow subscribers to a service, rather than with the public at large. If the sharing model does prevail, higher utilization for each car would, of course, mean fewer vehicles relative to the population. Environmentalists and urban planners would likely be overjoyed; automobile manufacturers not so much. Beyond the prospect of fewer cars per capita, there could also be a significant threat to luxury automotive brands. If you don’t own the car and will use it for only a single trip, you have little reason to care what make or model it is. Cars could cease to be status items, and the automobile market might well become commoditized. For these reasons, I think it’s a good bet that the auto manufacturers will cling pretty tightly to keeping someone in the driver’s seat—even if he or she rarely touches the controls. Automotive manufacturers could be poised to face the kind of dilemma that powerful companies often encounter when disruptive technologies come along. The company is forced to choose between protecting the business that provides revenue today and in the near future—or helping to propel an emerging technology that may ultimately devalue or even destroy that legacy business. History shows that companies nearly always choose to protect their established revenue streams. If the kind of revolution that Brin envisions is to unfold, it may have to arise outside the automotive industry. And, of course, Brin may be in exactly the right place to make that happen. If the individual-ownership model for cars ultimately falls, the impact on broad swathes of the economy and job market would be extraordinary. Think of all the car dealers, independent repair shops, and gas stations within a few miles of your home. Their existence is all tied directly to the fact that automobile ownership is widely distributed. In the world that Google envisions, robotic cars will be concentrated into fleets. Maintenance, repair, insurance, and fueling would likewise be centralized. Untold thousands of small businesses, and the jobs associated with them, would evaporate. To get a sense of just how many jobs might be at risk, consider that, in Los Angeles alone, about 10,000 people work in car washes. This post was excerpted from Martin Ford’s new book Rise of the Robots: Technology and the Threat of a Jobless Future. He’ll be here to answer your questions about our automated future at 1-2pm EST today.